When it comes to bedroom flooring, people tend to lean towards carpet. Carpet's ability to add warmth and quiet to a room are naturals for a bedroom. Other flooring options have a lot to offer for bedrooms. Just which floor is right for your bedroom? Let's review a few bedroom flooring trends to help get your ideas flowing. A dark hardwood isn't just a hot design trend, it's a great way to make a bedroom of any size feel like a cozy retreat. Whether you go with laminate wood flooring or solid hardwood, a wood floor can lend a rustic feel or modern edge depending on the type and plank size you select. Wood floors are surprisingly versatile and a beautiful addition to any bedroom. Another key benefit to wood floors? They are very allergy friendly. Wood floors won't trap dust mites or other allergens and are easy to keep dust-free with a simple dry mop on a regular basis. Tile flooring makes for an easy-to-maintain bedroom flooring option that is also allergy friendly. Tile comes in such a wide variety of shades and textures that it can really add a distinct design style to your bedroom. Porcelain tiles are perhaps the most versatile of tile floors with their ability to mimic many other styles of flooring. 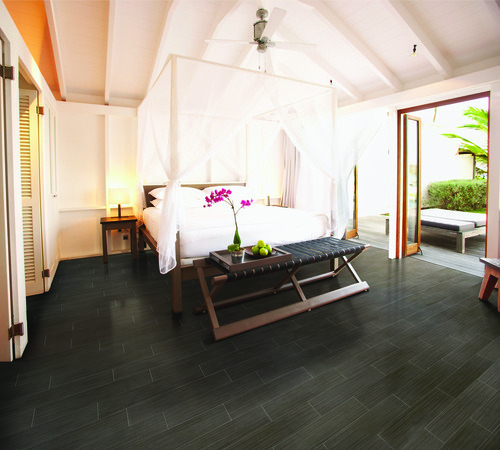 Luxury vinyl tiles are another affordable option that is becoming more and more popular. Learn more about versatile tile flooring. Area rugs. Area rugs. Area rugs. Area rugs are making an appearance in more and more bedrooms. They are the perfect way to add an extra touch of softness. Think you can only place an area rug on a hardwood or tile floor? Think again! Layering textures and colors is a big design trend and an area rug (or two in different sizes) on top of your carpet is a fun way to add some comfort and flair to your bedroom. Discover the beauty of area rugs. A side note about area rugs: Kermans Flooring got our start in area rugs and they remain one of our most popular flooring options today. Handmade vs machine-made. Standard shapes vs custom designs. Our design staff can help you find exactly the right area rug for your room. We can even take a carpet and cut it down to create a truly custom area rug! Looking for more flooring design trends? Check out our Pinterest boards for design tips and trends.